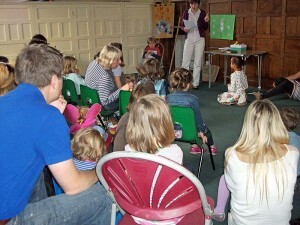 The Junior Church meets every Sunday during the 10.30am service and children of all ages are welcome. In the main group there are children aged birth to 7 years and we also have a smaller group for the over 7s. These groups are led by a small band of volunteers who enjoy working with the children and teaching them more about our Christian faith. Parents of the youngest children are encouraged to stay with them, but once they are of school age the children are usually happy to come on their own. At the beginning of the service the children process around the church with their Junior Church banner and congregate at the Chancel steps for the welcome and confession, before proceeding into the hall for their own ‘special time’. Each session in the hall starts with a prayer and a story, usually connected to the Gospel reading for the day. This is followed by a variety of craft or colouring activities, some of which can be taken into church or displayed in a group picture, although the children often prefer to take their efforts home. If there is time (or if the sermon is particularly long), there may also be a short period of singing. The older group have separate activities appropriate to their age and understanding, including the discussion of Bible passages and learning about the liturgy. All the children return to the service for the Eucharistic Prayer and are encouraged to approach the altar for a blessing when their parents receive their communion. Our aim at Junior Church is to encourage children to grow in their faith and to become involved in the worship at St Mary’s and we hope that all children, both from our regular congregation and visitors to the church, have a positive and beneficial experience with us.